We now offer FREE super saver shipping on all orders over $99 shipping to the continental United States. Expedited shipping options including overnight, saturday delivery, 2-day, and 3-day shipping options are available for an extra charge. To determine the shipping rate for expedited services add the products to your shopping cart, and enter your zip-code. All of the available shipping options will be displayed along with the transit times. Below is a map showing the UPS Ground Shipping time table. 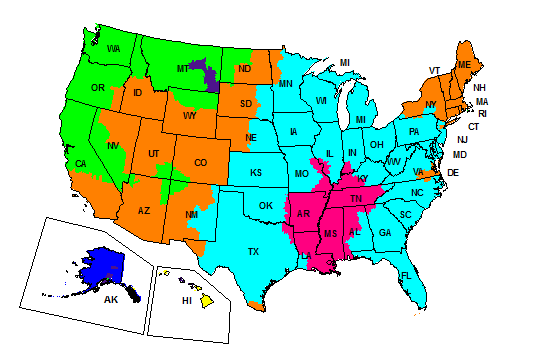 Locate where you live in the colored area & you'll be able to determine the transit time for your package. This map is only an estimate. Please Note: Refunds for shipping delays will only be honored for expedited services, orders with free super saver shipping are not eligible for a shipping refund should a delay occur. If a delay occurs when using any of our expedited shipping services, only a refund of the shipping charges paid will be given (per carriers service guide), and we will be unable to accept any returns. Premier Glow, does not sell merchandise on approval. Returns are only made for defective merchandise. It's our goal to make your shopping experience with us a pleasurable one. Strict quality control by the manufacturer before shipping ensures a minimal amount of defective items. When pricing our products we take into account a 5% defective rate. Any defective items greater than 5% will be issued a store credit towards a future order. Notification of shortages must be made within 3 days of receipt . Any defective merchandise greater than 5% must be reported within 5 days of delivery. Premier Glow will issue a store credit to be used on a future order for all defective merchandise and shortages. I.E. If you order one tube of 100 8" Glow Bracelets ($18.00), and 6 bracelets are found defective, a store credit of $1.08 cents would be issued. Occasionally colors or styles of a particular item might vary from the picture shown on the website. The variation can include colors included in an assortment, led colors, or product color. If you are in need of something specific, please contact customer service to confirm.